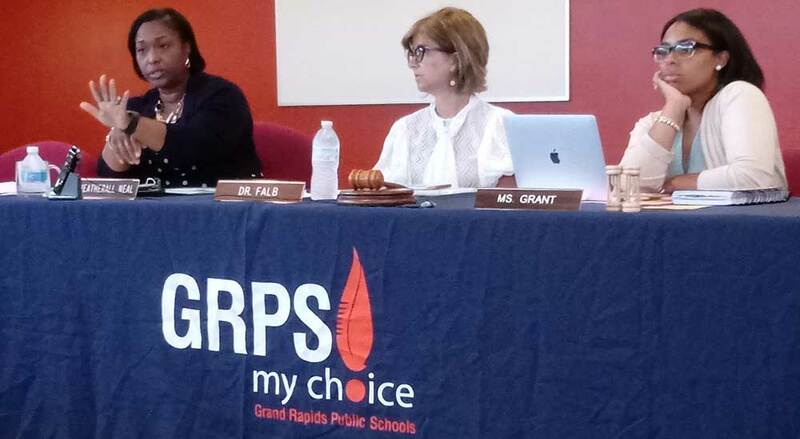 After decades of providing special-education services to students throughout Kent County, the Grand Rapids Public Schools Board of Education will soon decide whether to turn those programs over to Kent ISD. The school board plans to vote Aug. 6 on a recommendation by Superintendent Teresa Weatherall Neal to transfer operation of the center-based programs that serve nearly 1,400 students from all 20 school districts within Kent ISD. Serving students with disabilities such as autism spectrum disorder and severe physical and emotional impairments, the programs are run by GRPS on behalf of all the districts within Kent ISD. At a work session on Monday, Neal told board members she would like their approval to transfer the 11 center-based programs to Kent ISD by July of 2019. Doing so would benefit both students in GRPS and those from the 19 other districts, she said. The move would allow GRPS to represent its own 480 center-program students as part of a greater whole and also broaden oversight to all Kent ISD districts, she said, calling the proposal “a natural progression” of the district’s Transformation Plan. While not predicting how the board will vote, President Wendy Falb said she is receptive to the proposal. “It makes sense that GRPS focus on their core business, first and foremost … the students of GRPS who live in our district,” Falb said. The transfer would affect 425 GRPS teachers, therapists and others who staff the center programs. Mary Bouwense, president of the Grand Rapids Education Association, told MLive that staff members’ seniority should be honored and their salary and benefits not be shortchanged if the transition is made. The proposal follows months of criticism of GRPS special education programs, not just the center programs, by teachers and parents. With board support, Neal has said the vast majority of the criticisms are false, and that valid points have already been or are being addressed. It also comes amid an independent review of the center programs commissioned by the Kent ISD superintendents in response to the concerns. GRPS conducted its own internal program review last year, which recommended the district review its operation of the center programs. The review found the majority of such programming around the state is provided by intermediate districts, and that GRPS is unique in contracting with Kent ISD and the 19 other local districts. The recommendation to transfer center programs is not specifically in response to the protests, although those may have “accelerated” an idea that has long been discussed by Neal and others, Falb said. While the board has questions to address, she said she “didn’t hear any strong opposition” at the work session. “The big question is making sure we’re doing our fiduciary responsibility for the children, whether that’s going to be addressed by the ISD,” Falb said. She said the proposal makes sense to her, even though it wouldn’t be to the district’s financial advantage. Officials are still calculating the exact costs, but Neal said the district would lose over $1 million in indirect revenue for running the program. Center programs are funded by state and federal dollars, a countywide millage and per-student tuition from districts, said Chief Financial Officer Larry Oberst. “The deeper engagement across the county makes a lot of sense to me, when everybody’s got kind of an equal buy-in,” Falb said. 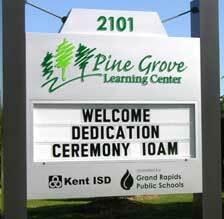 Kent ISD leaders are respecting the GRPS decision-making process, but are prepared to work with the district to ensure a “seamless transition” if the board decides to turn over the program, said Kent ISD Superintendent Ron Caniff. Caniff said he has informally discussed the idea with Neal for “quite some time,” prior to the protests, and was not surprised by the proposal. The timing is “advantageous,” he said, in that if GRPS does transfer the program, the review being conducted by consultant Beth Steenwyk would be expanded to help with the transition. Among questions to be answered would be how to handle contractual issues with GRPS teachers and staff in the center programs, he said. Falb and other board members said they hope most teachers and staff would remain with the program — and be well compensated — so that the level of services would remain as good as or better than it is now. Neal and others praised the quality of the staff, which includes 117 teachers, and said they would work collaboratively with Kent ISD to retain those who want to continue. Leaders said they’re confident students would continue to receive high-quality services if Kent ISD takes over the center program. Neal expressed confidence services to students would be as good or better if run by Kent ISD, noting many program requirements are dictated by law.